During the late nineteenth century, Maitre d’Armes Regis Senac was one of America’s most widely-known fencing masters. A native of France, Senac had arrived in New York City in 1872, and had set up a fencing school on University Place in Manhattan’s Greenwich Village. The Frenchman had reportedly fought three actual duels in France and had emerged victorious from all. Regis Senac. Source: New York Public Library. In New York City, Senac engaged in a number of high-profile, controversial fencing contests which were reported on by many major American newspapers. Although he had always emerged as the technical victor, many of these victories occurred by default when distinguished adversaries such as Colonel Thomas Monstery and Maestro Eugenio Pini stormed off the stage with disgust at Senac’s tactics and at the manner in which such contests were being scored. 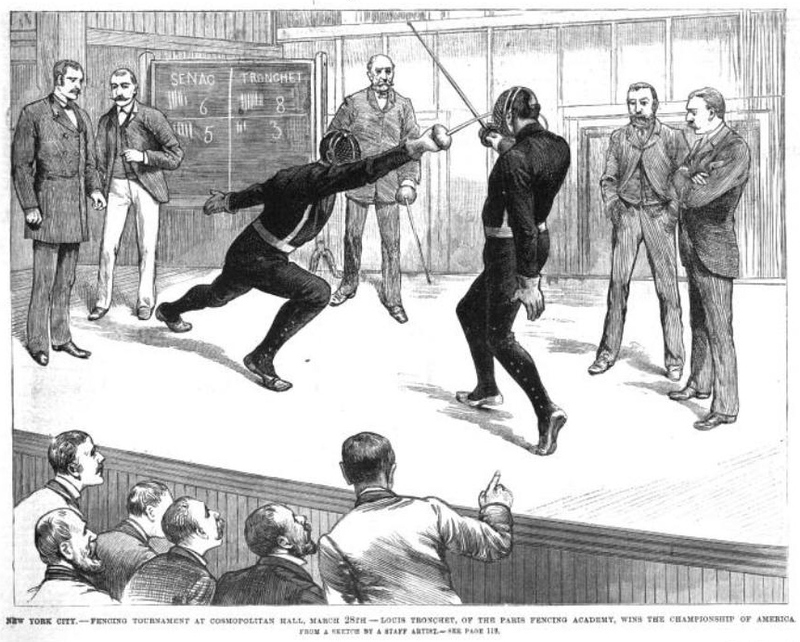 In 1884, during another contest between Senac and fencer Albert Vaughn, the latter walked off the stage after Senac disabled his sword arm with a vicious cut, with Vaughn alleging that Senac “was not disposed to act in a fair and gentlemanly manner.” Whatever criticism could be leveled at Senac, it is clear that within the context of a public fencing contest, he was a dangerous, or at least a puzzling, adversary. Then, in 1887, Louis Tronchet arrived in New York City. Tronchet was a formidable fencing master who had graduated from the famous French military academy of Joinville-le-Pont, at the head of his graduating class of six hundred. He was also a known expert at French savate, and offered instruction in cane self-defense for use in the street. In March of 1887, Senac reportedly made the comment that the recently-arrived Tronchet “knew nothing about fencing.” Tronchet overheard, or got wind, of the comment, and promptly challenged Senac—who claimed the title of “Champion of the Two Americas”—to a public contest of arms. The stakes were set at $1,000 dollars and the championship title of America. Senac accepted, and the contest was arranged to be held in Cosmopolitan Hall on March 28th. Cosmopolitan Hall, located on 41st Street and Broadway, hosted concerts, as well as a variety of events pertaining to subjects as diverse as flowers, ice skating, and horsemanship. A large building, it boasted a frontage of 90½ feet on Broadway, a depth of 157 feet on 41st street, and a backing of 100 feet on Seventh Avenue. In mid-1887, the theater’s interior would be reconstructed and the entire edifice renamed the Broadway Theatre, although the walls of the old building would remain the same. The most detailed account of the fencing contest between Tronchet and Senac, published in Outing Magazine, and reprinted below in full, sheds light on the different styles of fencing that existed in America during the late nineteenth century. THE SENAC-TRONCHET FENCING MATCH FOR $1,000 AND THE CHAMPIONSHIP OF AMERICA. This match, which took place on March 28th, at the Cosmopolitan Hall, has been the talk of the town for a month. The daily papers were full of it and gave extended and picturesque descriptions of the contest. Unfortunately, these descriptions were written by reporters who, clever and imaginative though they be, know nothing about the art of fencing, and would be very much distressed were they to be asked the difference between a seconde and a quinte. They praised the gracefulness of one man and extolled the agility of the other; they proclaimed that the first was superior in forcing the combat, and stoutly maintained that the second was the better in rapidly retreating when danger was near. All these statements, hashed up with different sauces to suit the partisan tastes of the reporters, and served hot next morning, were gobbled up with satisfaction by an ignorant public, but proved very repugnant to connoisseurs. And first, as to the men themselves. Senac is at least by four inches the taller, and was continually doing what is known among fencers as “tendre la perche;” in other words, not attempting to parry a thrust, but relying on the greater length of his arm, he endeavored to stop Tronchet before the latter’s sword could get to his body. This is poor fencing, though often successful. Tronchet, however, was not to be caught by such beginner’s tricks, and, by his superior agility, managed in every case but one to evade the threatening point. Besides, Senac is far more slender than Tronchet, thus affording less striking surface. As to Senac’s much-vaunted gracefulness, it brings a smile of amusement to the lips of every friand de la lame. Why? Because in fencing, correctness of position is the first thing, gracefulness the second. If the position be both correct and graceful, then the highest art is reached. But for a position to be merely graceful is not enough. An Oscar Wilde position may be very graceful in a drawing-room, but it cannot be called so in fencing, because it is not a position sous les armes. Therefore, Senac’s position was not a graceful fencing position, because it was not a fencing position at all. He stood straight up instead of bending his knees and having his body rest well on his hips. He never used his left arm to balance himself when lunging, and therefore, being unable to retreat promptly after thrusting, was often hit by a clever ripost. He usually rested his left hand on his hips, as if he were practicing broadsword, and even went so far as to let it hang idly by his side. His chest, instead of being well expanded and held straight, was always bent forward; Tronchet, on the contrary, unaffected by the interests at stake, maintained, during the whole length of the assault, a faultlessly classical position. Against a man who had the tremendous advantage of size, he made a clever use of the only means of balancing such a glaring inequality, that of his wonderful agility. Senac’s fencing was wild and irregular; Tronchet’s was ever regulated by the most approved methods and governed by the best and most correct principles. Even when retreating he always presented the point of his foil to the breast or his adversary, menacing him constantly in his advance. There is one thing we must say right here. We did not have really good fencing on either side; the interests at stake were too large to insure the calmness and equanimity which are absolutely necessary to first-rate fencing; the championship of America and the stake money of a thousand dollars depended on a few touches, and the two contestants were too excited to make use of all the means within their power. Were they to fence again, but in a salle d’armes, with nothing dependent on their skill but the honor of the victory, we would doubtless see marvelous work. Even as things turned out, there is no doubt but that it was the finest match seen in America, and, as The Times very correctly said, the first that was free of ante-contestive arrangements. The one mistake of the assault was to permit disarmament to count as a touch. This is never allowed in France, and a man striking another in a duel, after having disarmed him, would be guilty of murder. As Senac thinks his disarmaments one of his best shots, he insisted upon counting it, and Tronchet, unwilling to retard the match in any way, consented, under protest. Now that Tronchet is champion, however, he will be able to impose his own conditions, and refuse to consent to such an antiquated absurdity. To resume this criticism. Tronchet owes his victory to the correctness of his principles acquired in the best school in the world, that of Joinville-le-Pont, the Military Academy of France. In order to beat such a formidable adversary as Senac, he had to make use of rare skill and perfect method, and his victory is as much due to the simple and beautiful principles of the new school as to his own expertness and bravery. Senac, on the other hand, is personally an excellent fencer, his lunge is tremendous, his rapidity remarkable, his bottes are skillful, but his parries are weak, and his fencing belongs to the old school—it is wild, erratic, and without method—and to that he owes his defeat. The referee, Prof. Courbisier, of Annapolis, was a good referee as far as perfect impartiality was concerned, but he made several mistakes, and they all happened to be in favor of Senac. The most palpable of these was at the end of the second bout with the foil, when he declared that Tronchet was disarmed before he had touched his opponent. As Senac had parried en quinte, and as Tronchet’s sword left a beautiful, white, round spot on Senac’s breast, this was a physical impossibility, and the audience hissed the referee. The seconds did their arduous duties well. Tronchet was represented by Mr. Eugene Van Schaick, the President of the Knickerbocker Fencing Club, and by Maurice Bernhardt [the son of actress Sarah Bernhardt], and Messrs. Ronald Thomas and William Lawson acted for Senac. 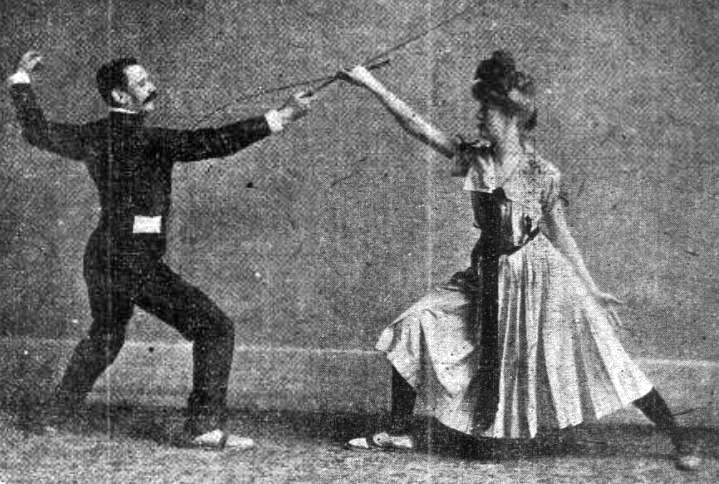 Tronchet demonstrates giving fencing lessons to Elizabeth Forbes in San Francisco, 1902. San Francisco Call. 2. New York Clipper, April 12, 1884. 3. H. Ansot, “The Metamorphosis of Fencing” in Overland Monthly and Out West Magazine, Volume 24, Issue 144, December 1894; 566-575. 4. Emilio Lastreto, “Fencing,” in The Making of a Man (San Francisco: H.S. Crocker, 1915), 68. 5. Louis Rondelle, Foil and Sabre: A Grammar of Fencing (Boston: Estes and Lauriat, 1892), 189. 6. New York Herald, March 15, 1887. 7. Watertown Daily Times, April 9, 1887. 8. New York Herald, March 26, 1887. 9. New York Times, March 29, 1887. 10. New York Herald, March 29, 1887. 11. New York Sun, March 29, 1887. 12. San Francisco Bulletin, March 29, 1887. 13. Frank Leslie’s Illustrated Newspaper, April 9, 1887. 14. Outing, May 1887, Vol. X, No. 2. 15. Courrier des Etats-Unis, December 11, 1887. 16. San Francisco Chronicle, November 18, 1888. 17. San Francisco Call, July 6, 1902. Given Columbia Classical Fencing’s renewed emphasis on classical form and restraint, this article is timely and very appropriate.